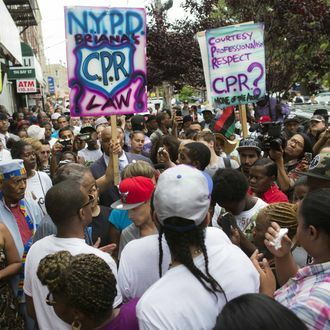 After being placed on modified duty on Sunday, the four Emergency Medical Service workers who responded to the scene of Eric Garner’s violent arrest have now been suspended without pay. The two EMTs and two paramedics, who have not been identified, are all employees of Staten Island’s Richmond University Medical Center. Their suspensions might have something to do with a recently released video of the roughly seven minutes Garner spent dying on the sidewalk after a group of NYPD officers jumped him and put him in a chokehold. In that footage, the EMS workers called to help the 43-year-old father of six seem to be making very little effort to do so. Though Garner was clearly unconscious, one of the workers can be seen telling him to “get in the stretcher.” None of the workers attempted to perform CPR on Garner, and it took them a leisurely looking three minutes to finally load him onto a gurney and put him in their ambulance. “I was distraught, I was upset and mad that the cops had him on the floor like that,” said Taisha Allen, the woman who made the recording. “And they should have performed CPR on him and they didn’t.” In a statement, Richmond University Medical Center said that it is currently investigating its employees’ role in the incident.